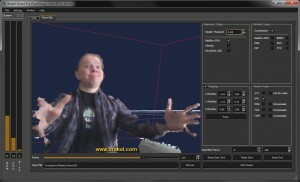 Brekel Kinect Pro Body and Pro PointCloud are now available from the brand new online shop, along with Pro Face as well as bundles with discounted prices. Trial versions are available from the products information pages from the menu on the right. Is there some sample data we can preview available? I would like to see how the data comes out in the better case scenarios. 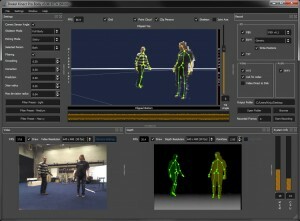 Particularly with regard to the floating feet i have seen in some data captured with the kinect. You can find example files in all the available formats on the download pages. A lot of times floating feet are caused by retargeting setups that only naively copy rotations and don’t take into account position data. Usually using the retargeter of Autodesk’s MotionBuilder or Maya and using FBX files as a source gives best possible results. I presume it only works with 1 Kinect, right? I hope 2 Kinects will be available soon, because right now you can’t really do much, just act silly while staying parallel to the camera. Also, it needs much better feet solving, you have the character floating in space way too much a t m. I think these 2 are the major issues, the rest, like jitter and imprecision… I think that’s a bit less problematic and easier to fix in Motion Builder. 1 Kinect for now yes. You can improve foot solving by using a non-reflective floor, and using a retargeter that knows how to deal with varying limb lengths, like Autodesks HumanIK/FullBodyIK. Instead of one that just copies rotations. Actually improvements for both those things are on the cards but I need a solid 2-3 months to really delve deep as they are complicated things to solve properly.